The first thing you'll need to do as you plan a remote-controlled lighting scheme is determine which control system is best for your home. There are several to choose from, and each type offers varying levels of complexity, ease of use and reliability. At the most basic level, plug-in light control allows homeowners to control lighting function and intensity easily from within the home. Plug in light controls work simply by plugging directly in to the home's electrical grid—a radio frequency (RF)-controlled module plugs into an outlet, and the homeowner can manually control the intensity and operation of any lighting connected to that outlet (generally up to around eight individual lamps). A remote control is used to control the lights, and can generally function from up to 150 feet away. This simple system may be appealing for smaller spaces and can also be set up to operate automatically via a timer, but it should be noted that RF-controlled remote schemes are often subject to interference, signal failure and range issues. The next level of complexity involves using your TV's universal remote to control your lighting scheme. Usually, this simply involves plugging the radio frequency controlled hub and an accompanying sensor into an electrical outlet near your TV. You'll need to set up your universal remote with a pre-programmed code to control the hub, and replace any wall switches in the area with remote-controlled switches able to communicate with the hub, and program each switch as well. 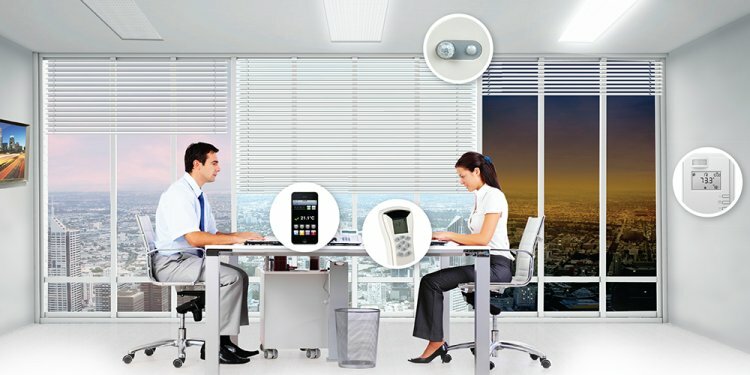 Once the remote, hub and switches are communicating with one another, your in-room remote-controlled lighting scheme is ready for duty. Finally, the ability to take advantage of wireless technology is always an appealing feature of any home automation system. It's no different with remote-controlled lighting, and the latest products will almost always include the option to operate wirelessly. One of the most popular features of these products is the ability to control the lighting inside or outside your home with your smartphone or other wireless device. To utilize this feature, it's usually necessary to connect a light control hub to your wireless router, which will then relay lighting control information to your smart device. This way, you should be able to send information to your lighting automation system from anywhere with internet access.